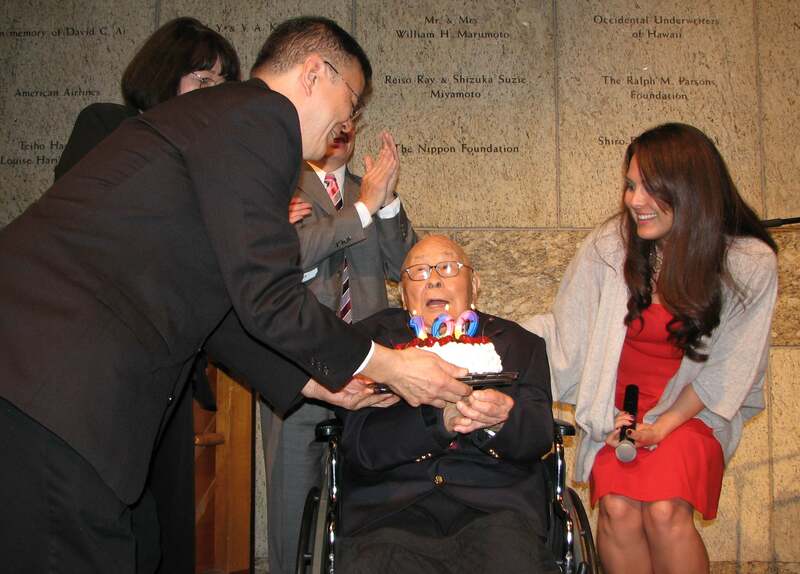 YMCA icon Fred Hoshiyama and friends celebrate his 100th birthday. Fred Hoshiyama receives a lifetime achievement award from Rodney Chin, executive director of the BuchananYMCA, and Kathy Cheng, CFO of YMCA of San Francisco. In 1914, President Woodrow Wilson established Mother’s Day, Babe Ruth made his major league debut, the Panama Canal opened, World War I started — and Fred Yaichio Hoshiyama was born in Livingston, Merced County. About 150 friends, relatives and associates of Hoshiyama, a hero and a legend to both the YMCA and the Japanese American community, gathered Dec. 7 to celebrate his 100th birthday at the Japanese American National Museum in Little Tokyo. Attendees lined up to congratulate the guest of honor. Because his vision and hearing are impaired, each guest was given a card with his or her name printed in large type and was asked to show it to Hoshiyama, who warmly greeted each well-wisher. Birthday messages were written on the back of each card to be read later. Nelson Louis, president and CEO of the YMCA of Greater Bergen County in New Jersey, served as co-emcee. “It was in 2008 that we were here last … It was Fred’s 93rd birthday party,” he recalled. “We had the honor of announcing the creation of the Fred Hoshiyama Asian Leadership Fund of the Y-USA. 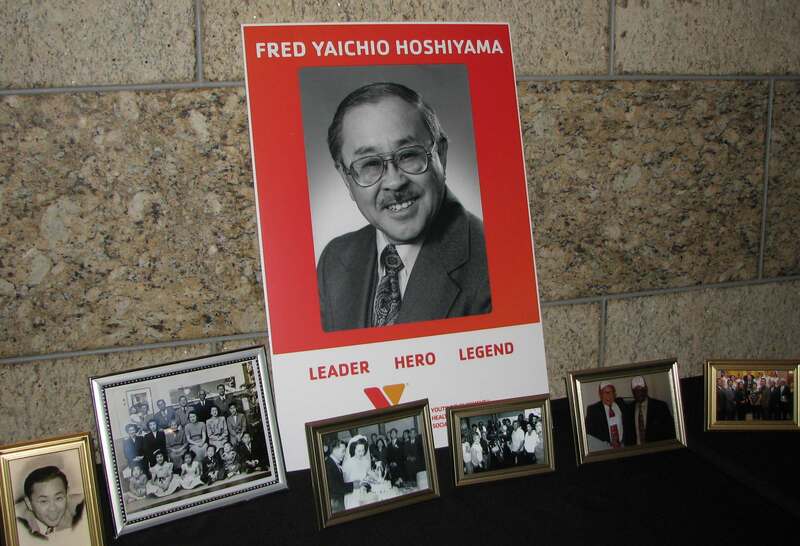 That fund was an endowment fund set up to honor Fred’s legacy of developing Asian leaders in the YMCA. Co-emcees Nelson Louis and Florence Ochi. 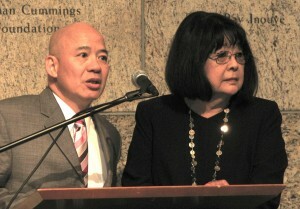 Florence Ochi, who worked with Hoshiyama on establishing JANM, organized the event and served as co-emcee. She recognized current and former YMCA staff members and representatives of other organizations that Hoshiyama has worked with as a board member and fundraiser: Little Tokyo Service Center, Japanese American Community Services, Japanese American Korean War Veterans, Venice Japanese American Memorial Marker Committee, Venice-Culver JACL, and Go For Broke National Education Center. She added that Hoshiyama’s family members “came from all over California and the East Coast to be here. They wouldn’t miss this event for anything.” Also present were members of his church, Palms Westminster Presbyterian. 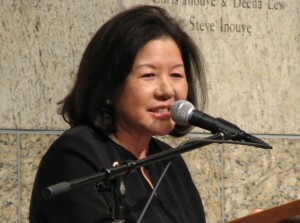 Irene Hirano Inouye, founding CEO of JANM. 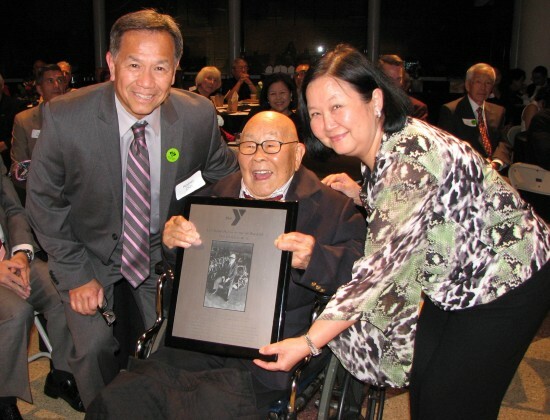 Hoshiyama was presented with an award by Rodney Chin, executive director of the Buchanan YMCA in San Francisco, and Kathy Cheng, chief financial officer of YMCA of San Francisco. 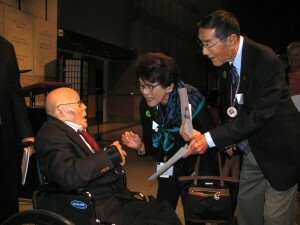 Following the Pearl Harbor attack, which happened on Hoshiyama’s 27th birthday, he was interned at the Tanforan Assembly Center and Topaz, Utah, and organized YMCA programs in camp. During his nearly 39 years as a full-time employee of the YMCA, Hoshiyama served in local, regional and national staff positions in California, Connecticut, Hawaii, Massachusetts, New York and Illinois. He then became a part-time consultant and full-time volunteer. The lifetime achievement award — which had also been presented to Hoshiyama at a birthday event in Long Beach — inducts him into the Buchanan YMCA Wall of Fame. Fred Hoshiyama receives a birthday cake from his son Matthew. At right is singer Lauren Kinkade-Wong, Hoshiyama’s cousin’s granddaughter. Matthew Hoshiyama, Fred’s son, said that his father’s birthplace was Yamato Colony, which was founded in 1906 by Japanese Christian immigrants who belonged to the Japanese YMCA. The first of six children born to Yajuro and Tani Fusa (Takato) Hoshiyama, both from Niigata Prefecture, Fred lost his father, who was only 46, in 1922 and lost his sister and a brother around the same time. His mother raised four sons on the farm, struggling through poverty and starvation for seven years. A display showed scenes from Fred Hoshiyama’s life. In 1929, friends of the family moved them to San Francisco. Fred had a paper route, worked in sales and marketing for the Nippon Goldfish and Tropical Imports Co., earned a bachelor’s degree from UC Berkeley in 1941 and a master’s in education from Springfield College in Springfield, Mass. in 1945, and did graduate work at George Williams College in Downers Grove, Ill. and Yale Divinity School in New Haven, Conn.
Fred Hoshiyama and Irene Sumiye Matsumoto were married in 1948 and had a daughter, Bella, and a son. They were married for 58 years. Well-wishers included Mary and Babe Karasawa. Matthew shared fond memories of fishing with his dad as well as helping out at the “Y” on weekends, mopping floors and replacing lights. 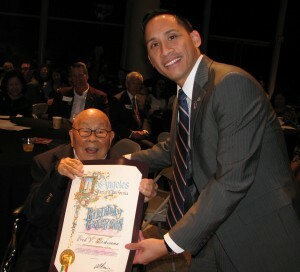 Fred Hoshiyama receives a proclamation from Los Angeles City Councilmember Mike Bonin, presented by field deputy Len Nguyen. After blowing out the candles on his birthday cake, Hoshiyama said, “I want to welcome everyone here because you are responsible for what happened. You built this place, this museum, and … we appreciate what you have done to make this possible.